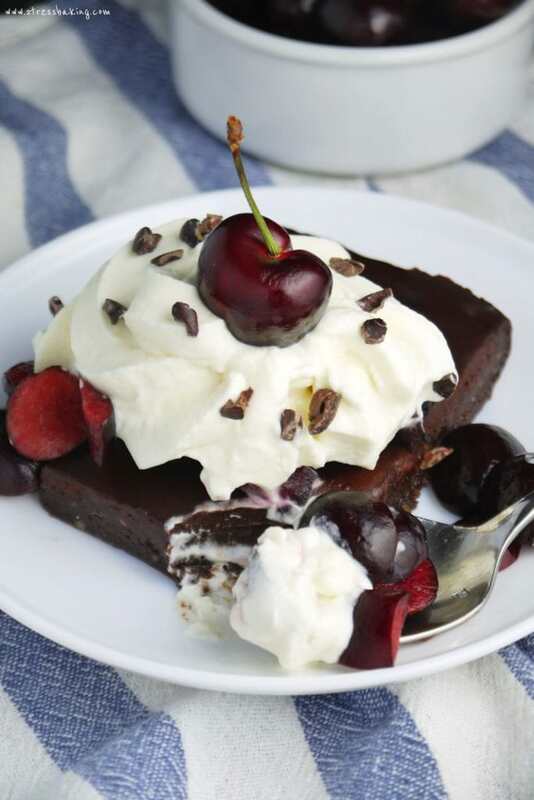 No-Bake Date Brownies + Black Forest Sundae! 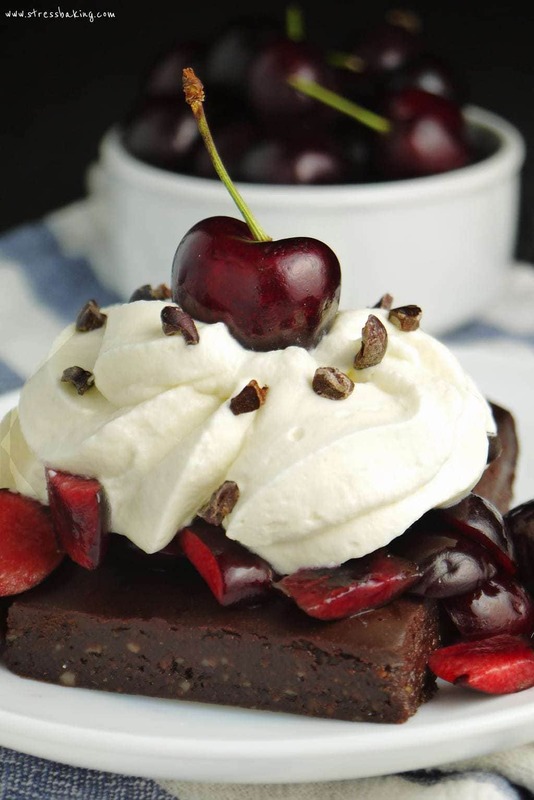 Rich, decadent brownies that are no-bake, no refined sugar, gluten free and vegan! I sat down to write this post and realized it’s been almost a month since I last posted. What?! Time flies when you’re having fun at your new job! 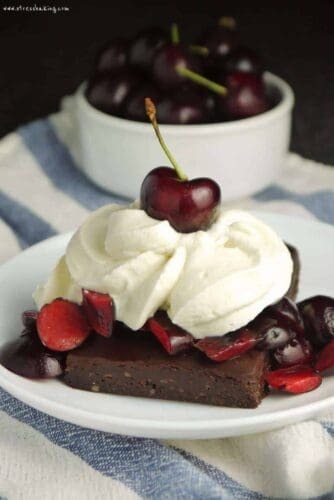 The good news is that while I’ve been absent from the blog itself, I’ve been very present in the kitchen and I’m happy to bring you Black Forest Sundaes featuring No-Bake Date Brownies! Just look at that thing. My favorite thing about it is that I feel zero guilt eating it. None. Zippity-do-da. You know why? Because they’re healthy. 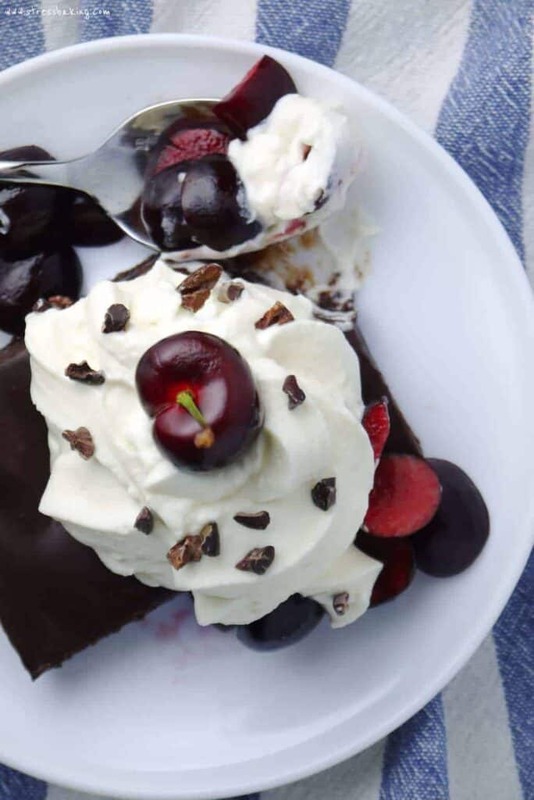 Almost everything you’re seeing in that picture adds up to a healthy dessert that will cause you no regrets and won’t throw a wrench in your diet. 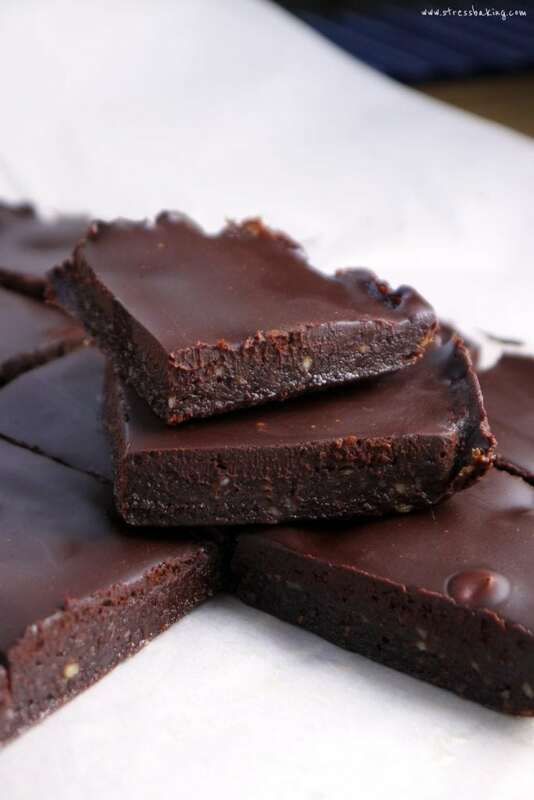 These brownies (original recipe over on Chocolate Covered Katie – she’s a freaking genius) are almost more of a fudge, and I find myself using a spoon or fork to eat them rather than picking them up by hand because they get messy once your fingers warm them up a bit. Mind you, I’m not above being covered in chocolate, but utensils do save me a little embarrassment. I embarrass myself plenty, I don’t need to add wearing a chocolate date pore mask to the list. Ingredients? You don’t need any gluten or dairy. Outside your typical pantry staples, you just need some walnuts, dates, coconut oil and cherries. In terms of equipment, you don’t need an oven, a stove or a Kitchen Aid for these. All you need is a food processor, a microwave to melt a little coconut oil and a fridge to store them in when you’re done. And prep time? Let’s say – to be on the safe side – 15 minutes. The rest of the time is spent letting them chill out in the fridge while you dance around the kitchen to celebrate how awesome you are. These are easily vegan, and easily not vegan – no tricky substitutes. 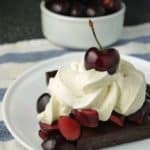 You could make some coconut whipped cream to keep things dairy free and on the healthier side, or my favorite mascarpone whipped cream if you’re okay with adding some calories. 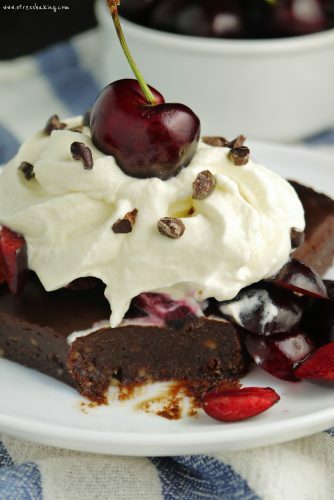 Or just omit the whipped cream altogether and load it up with chopped cherries and cacao nibs. No matter what you do, it’s going to be rich, decadent and delicious. Now show me what you’re made of – or at least your dessert. Tag #stressbaking on Instagram so I can see what you make! In a food processor, pulse walnuts until chopped very small. Add dates, cacao, coconut oil, vanilla, salt, and cinnamon and process until smooth, scraping down as needed. Line an 8×8 pan with parchment paper and press dough into pan. Make sure dough is evenly distributed. In a medium bowl, combine cacao, honey/maple syrup/agave, coconut oil and vanilla. Pour over brownie dough and smooth with a spatula until evenly distributed. 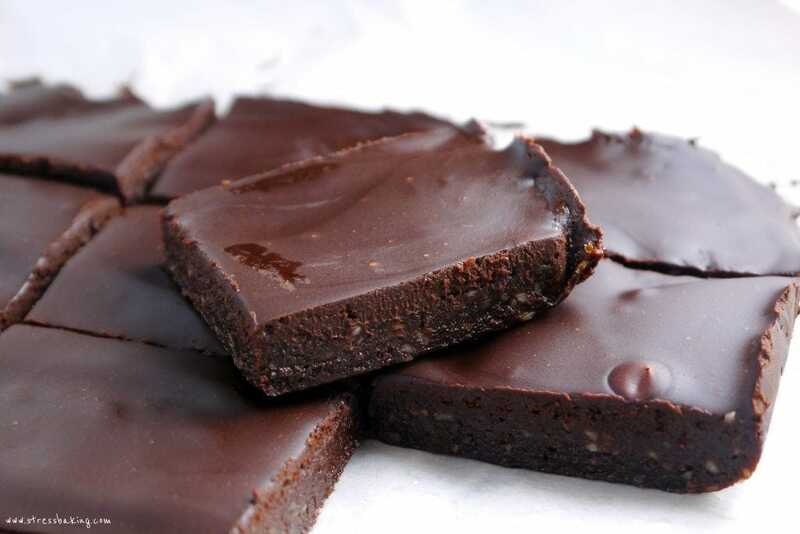 Refrigerate brownies for at least 2 hours to set. Cut into 9 or 16 bars. 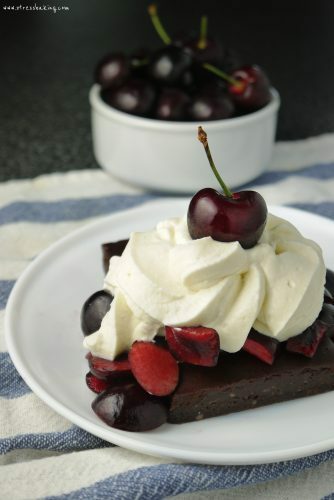 Keep refrigerated until serving, top with your favorite whipped cream and chopped cherries then enjoy! Make a small batch of Mascarpone Whipped Cream (or your favorite whipped cream). Slice or chop 16 cherries (get rid of those pits!). 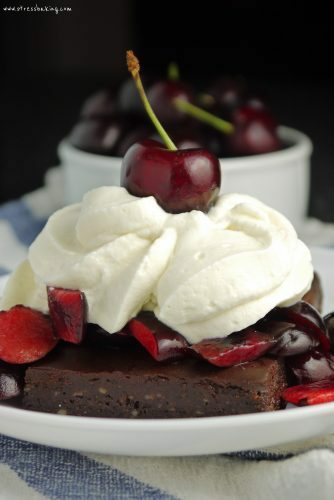 Top each brownie with cherries and whipped cream. Serve immediately and enjoy! Where is the part about how to store the rest of your date? It depends on the person, but I think just one date would be enough to make several batches of these. Tips on how to get the date would be great too. Should we sniff them before we ask them out, to see if they’d be good in this recipe? Oh, dearest troll. How I’ve missed you.